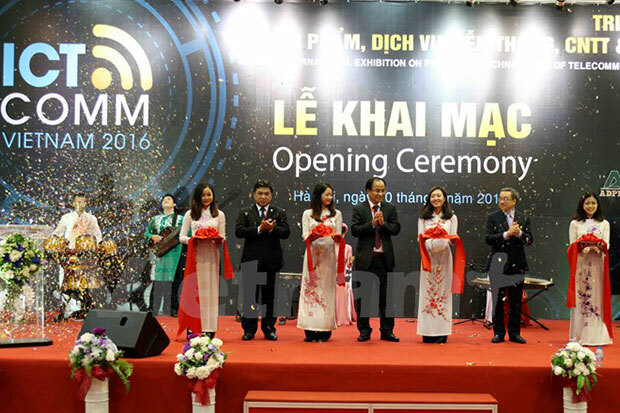 The Vietnam ICT COMM 2016, an exhibition of information and communication technology opened in Hanoi on July 20. On display at nearly 200 domestic and foreign booths are information and communication technology products, telecom and Internet services and applications, as well as games, software, electronics and ancillary industries. Speaking at the opening ceremony, Deputy Minister of Information and Communication Phan Tam noted that the event is a promising start for Vietnam to carry out a programme to develop broadband telecommunications infrastructure by 2020. The exhibited products and services at the event are expected to be widely used, contributing to socio-economic development, Tam underscored. The three-day event creates a venue to link local and foreign enterprises while serving an effective interactive channel for policy-makers and the business community to fulfill the legal environment, which will help branch out the Vietnamese information and communication industry. Participants at the exhibition will have a chance to share experience in innovation, business management efficiency and the application of IT in trade activities. Seminars on developing mobile phone apps, network security, job-oriented consultations and ICT resource training are also scheduled at the event./.